The residents of the Namosau HART Home in Ba were challenged to take ownership of project that is in line with Government agendas. 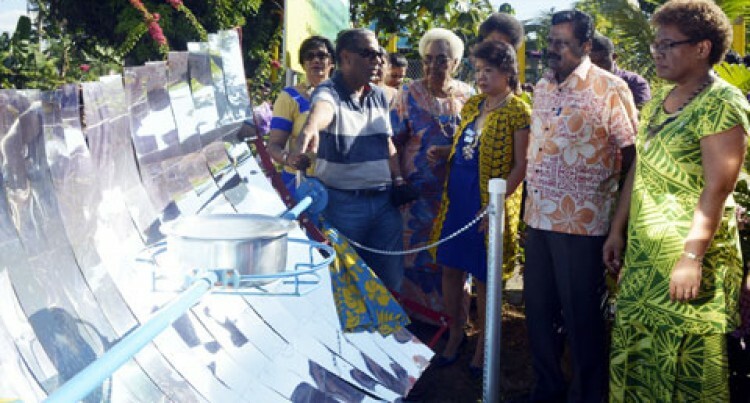 Those were the words of Minister for Lands and Mineral Resources Mereseini Vuniwaqa while officiating at the official launch of the Solar Cookery Project last Saturday. “I challenge you to take ownership of this project which has been brought to your doorstep by SI (Soroptimist International Fiji) and use it as an icon to your children.” Ms Vuniwaqa said. Ms Vuniwaqa praised the Soroptimist International Fiji team for the eco-friendly initiative. She said the project had drawn Government, civil organisations and communities together to work towards developing a better, cleaner, healthier, sustainable and resilient Fijian community. “This has also empowered our women and educated our children to be innovative and to recongnise the cleaner alternative of solar energy as a reality for us,” Ms Vuniwaqa said. She also mentioned other corporate organisation like Future Farms Limited, a BSP Life company patterning with Sunenegise International, the first Pan-Pacific solar energy provider has turned its property in Ba to be one of the leaders of green energy in Fiji. She said Government was committed to reducing fuel consumptions and ensuring that Fijians had adequate energy to provide for household needs. Meanwhile, Government, through the Department of Energy has installed solar street lights at the Koro Jetty, solar home systems in Naibalebale, Yasawa, and Cawaro Village at Udu Point in Vanua Levu and a water pump powered by solar energy on Tavea Island in Bua and Mali Island in Macuata.